- Stephen Coleman, born 1920, remembers first serving Mass at New Southgate when he was 11 years old. I became a member of the Parish of Our Lady of Lourdes, New Southgate, in Autumn 1931 after my family moved from Stamford Hill to Durnsford Road and then to 22, The Drive, Bounds Green. My father was the Head Master of St. Paul’s Primary School in Wood Green at that time. 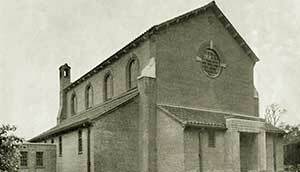 The Parish of Our Lady of Lourdes had been established in the Diocese of Westminster in 1923. As the church wasn’t built until some years later, Mass was said in the Presbytery - the same house that is the Presbytery today. It was a huge house, complete with integrated coach house, stable and hay loft ( which was used later to garage the Priest’s car, and for Parish Society meetings). The house was probably Georgian with many servants’ rooms and a separate staircase. The house was purchased with at least an acre of orchard surrounding it. In modern times this provided enough space for the church (built 1935), the Primary School (built 1975), and the extended church with car parking space (1990). We have now put all the photos from the parish archive into a gallery where they can be seen at larger resolutions. There are also many more to take a look at, including two of Fr Haughey and some fascinating old documents about Fr Sunn and the founding of the parish. So thanks to Marco for doing this and please take a look (remember, there are two pages to the gallery, so don't stop after the first one). The choir's founder was Father Denis Crowley who, on his arrival in New Southgate in July 1944 as Father Sunn's newly ordained first curate, got a choir together in time to sing at Midnight Mass at Christmas 1944, when the church had to be blacked out as the war was not over. Thus 1945 was the first year of the choir's existence. In those early days, the Sung Mass was 10.30am and four-part Latin Masses and motets were sung, with plainchant during Lent and Advent. Father Sunn died in 1953 and, in 1956, when his successor, Father George Eldridge, celebrated his Silver Jubilee, Father Crowley organised a concert in his honour at the Intimate Theatre, Palmers Green, and recruited a choir of male volunteers from the Knights of St Columba to sing the hymn to St Edmund as part of the programme. One of these volunteers, Peter Wurr, remained to become a mainstay of the church choir, acting as assistant conductor and taking over as choir master in 1964 when Father Crowley went to Hackney as parish priest and Father Eldridge was replaced by Father Haughey. Contact with Father Crowley was not lost over the years and, in 1969, we went to Hackney to sing at his Silver Jubilee Mass and again in 1980 at his Requiem. During the fifteen years or so from 1955 most members of Our Lady of Lourdes choir also belonged to the Westminster Diocesan choir, where we learnt much from Father Wilfred Purney and sang the Whit Sunday Mass in the cathedral every year. We also went to Paris in 1957 and Cologne in 1961 for the Congresses of Sacred Music.